Some think that Washington is pointing toward the future, foreseeing bright prospects for his nation. Others believe that Washington is saying farewell. When this portrait was painted, he was about to leave office after having served two terms as President. Viewing the portrait, an observer saw him bestowing his good advice to his countrymen. Others have inferred that the painting commemorates the recent signing and ratification of Jays Treaty. 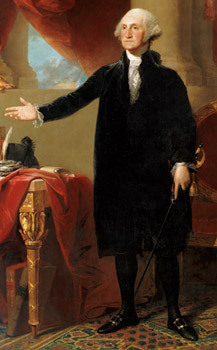 Washington is, by one appraisal, a paragon of virtue and, as such, a source of national pride and inspiration. His dignified stance lends a regal air to the portrait, calling to mind contemporary portraits of royal and noble figures of the day in England and Europe but also a strength and simplicity fit for a leader of a new republic. Washington is about to retire from government service, saying no consideration under heaven that I can foresee shall again draw me from the walks of private life. His recent months have not been tranquil. In a rare display of partisanship, he has fought against opponents of Jays Treaty, which settled several issues left unresolved by the 1783 treaty that ended the Revolutionary War. John Jay negotiated the treaty that bears his name; coincidentally, Jay also introduced painter Gilbert Stuart to President Washington. Soon Washingtons countrymen will read his Farewell Address, which he did not deliver in person. It appeared first in a newspaper on September 19, 1796. In it, he warned of the dangers of forming permanent foreign alliances and of the divisiveness of political parties. When Gilbert Stuart painted this portrait, Washington was 64 years old and looking forward to retirement at Mount Vernon. He had felt the same way after the Revolutionary War, when he said he wanted to follow the example of the Roman citizen-soldier Lucius Quinctius Cincinnatus, and live under my own Vine and my own Fig-tree, free from the bustle of a camp and the intrigues of a court. But his postwar wish to glide gently down the stream of life was not to be. Now, in 1796, he is finally going to get his wish. But his retirement will be tragically short: He will die at Mount Vernon in 1799. Gilbert Stuart knew that Washington lacked time and patience for posing. There is no record of how many times Washington posed for the portrait, but typically there would have been at least three sessions, each lasting about two hours. The artist usually devoted what time he had to focusing on the subjects face and perhaps the hands. A talented artist like Stuart could paint the rest from his imagination or from a discreetly recruited model. Stuart had painted bust-length portraits of Washington twice before, but the portrait painted for the Marquis of Lansdowne was the artists first full-length portrait of the President. For Washingtons body, Stuart used at least one stand-in. Contemporary accounts name three men who may have posed in Washingtons place: W. Moore Smith, in whose house Stuart painted the portrait; Michael Keppele, a Philadelphia alderman (whose daughter made the claim); and the Comte de Noailles, a friend of Stuarts.